Another in a series of posts about exotic citrus. Those of you who follow my tweets (@manhattan_up) know I was recently blown away by a cocktail made for me by LCL contributor Brooke Arthur at Range. 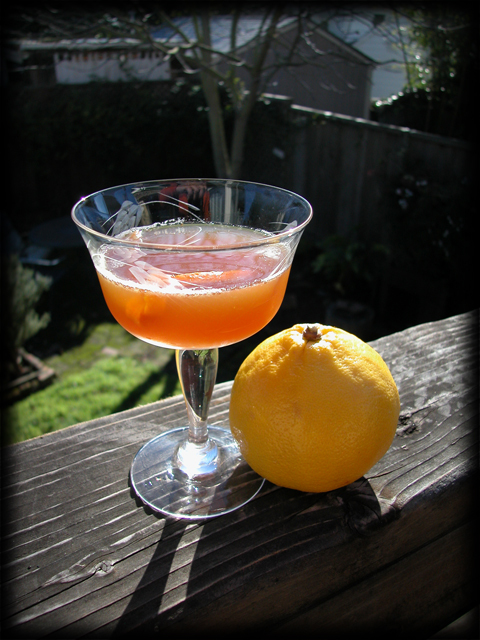 It was called the B-Line, a variant of their Third Rail cocktail, made with fresh squeezed Bergamot oranges. I left Range on a mission to find Bergamot oranges so I could re-create this amazing cocktail at home. Over the next few days I scoured the markets I know carry unusual citrus. When I inquired about them at my favorite Berkeley Bowl I was told only that they had come and gone. [See UPDATE at the end of this post.] 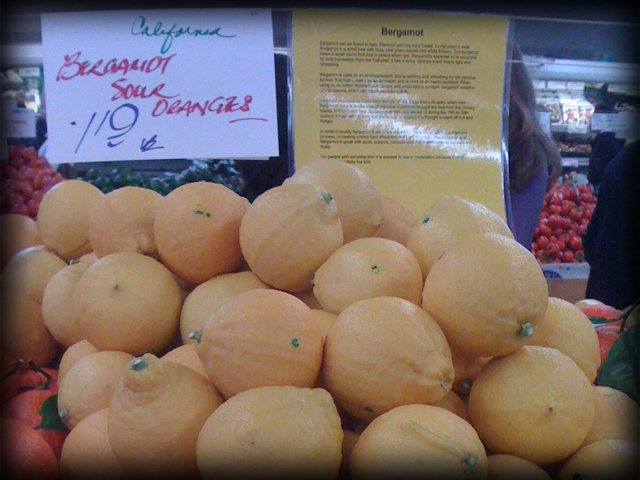 However I persisted and finally located Bergamots at Monterey Market in north Berkeley. Joy! The bergamot Citrus aurantium subsp. bergamia (Risso & Poit.) synonym (Citrus bergamia Risso) is a fruit the size of an orange, with a yellow color similar to a lemon, and has a pleasant fragrance. The juice tastes less sour than lemon, but more bitter than grapefruit. The best Bergamot fruit are grown in the province of Calabria in Italy, where the juice is used as a folk remedy for malaria. Reggio Calabria, the capital, is in fact sometime called “The city of Bergamot.” The fruit may also be made into marmalade, which after tasting the fruit, I could see being delicious. While I loved the B-Line (see recipe below), I felt the intensity of the Bergamot would be further complemented by additional spice and complexity, specifically a higher-proof bourbon than the Bulleit and an amaro in place of the Lillet (which is pretty lightweight). 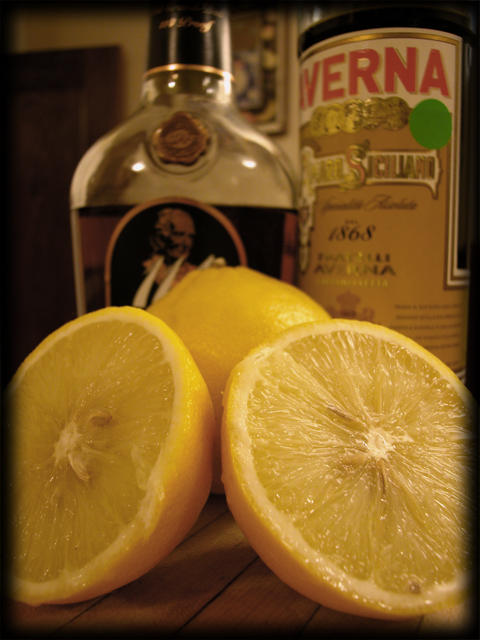 After a bit of tinkering, I came up with this libation named for the region in Italy where the best Bergamot fruit are grown. NOTE: I wanted to continue the tradition of giving train-related names to derivatives of The Third Rail. 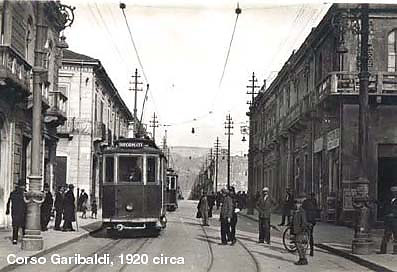 Unfortunately, the tram system in the capital of Calabria, Reggio Calabria, doesn’t have a distinctive name. Here is a beautiful old photo of the capital with a tram to go with this delicious cocktail anyway. Shake everything, but the garnish, hard over ice. Garnish with the knotted orange peel. NOTE: This cocktail just got a nice write up on sfist.com. Here’s the link. (*) – The recipe outline on the Range blog “Cocktail of the Day” calls for the chunk orange but I am pretty sure Brooke made it for me with a piece of peel in the shaker. The moral of the story, I guess, is to take what the produce people there have to say with a large grain of salt. Last summer I purchased a few exotic dwarf citrus trees: calamondin (which I’ve previously written about), kaffir lime (from which I’ve made a very pungent tincture) and chinotto, a variety of Italian sour orange which I am told is used to flavor many amari including Ramazotti. 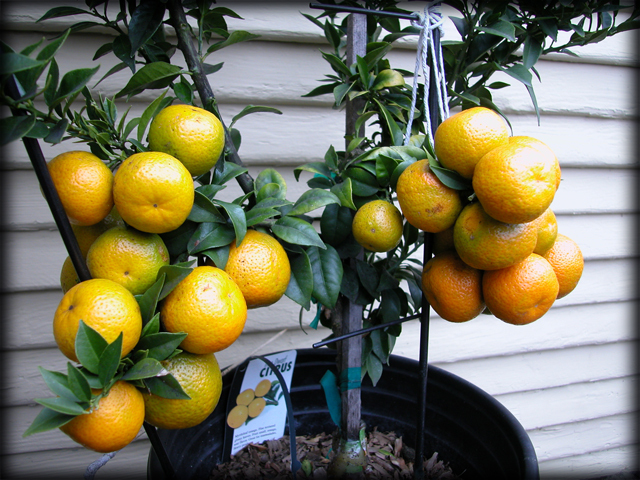 Despite some serious rain and cold over the last couple of weeks, the chinotto (also known in the US as myrtle leaf oranges) are now ripening very quickly, which means I will soon need to decide what to do with them. A tincture from the peel to use as the basis of an aromatic bitters seems like an obvious choice. I am also considering macerating some whole fruit from which I can attempt a “digestif” but I am flying blind here. I’d love to hear any suggestions you all might have. 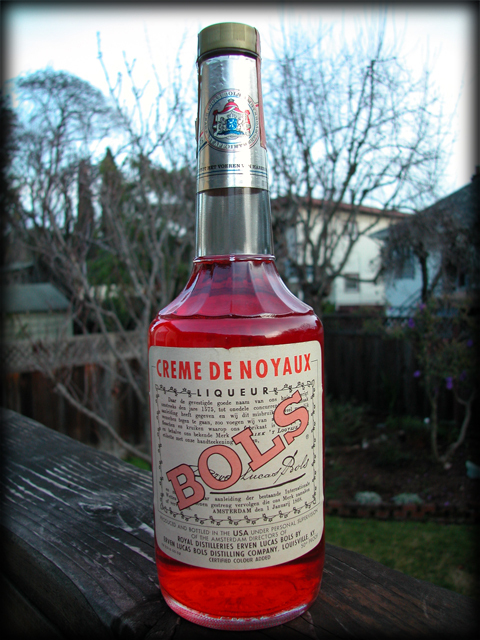 Produced and bottled in Louisville, KY.
Label indicates “certified colour added” on front label. (N.B. British spelling of “color”). 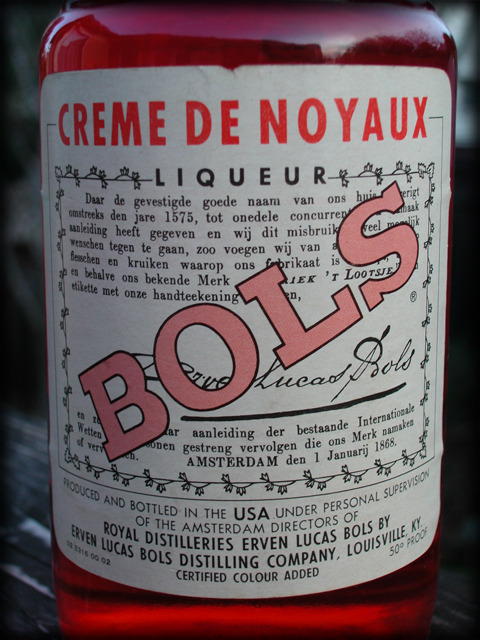 All other label text in Dutch. Bottom of bottle impressed with text: “ERVEN LUCAS BOLS LIQUOR BOTTLE” and the number “60 78” plus a couple of other symbols I cannot make out very clearly. I’m guessing it’s at least 25 years old since as best as I can determine the very last tax stamps were used in 1985. 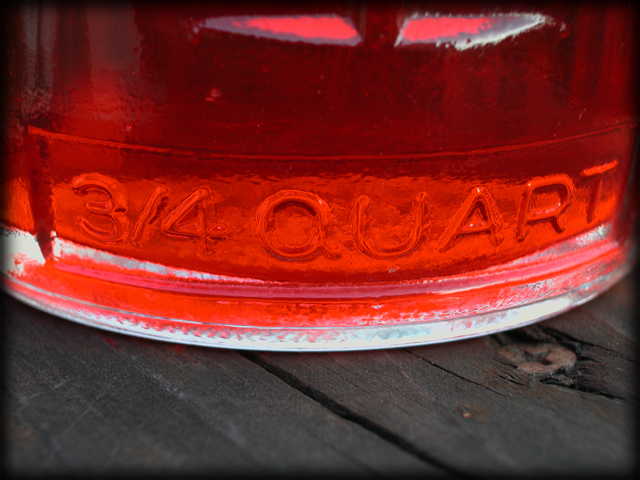 I’m also guessing it may be colored with cochineal rather than a completely artificial coloring. (It’s actually rather lurid looking.) 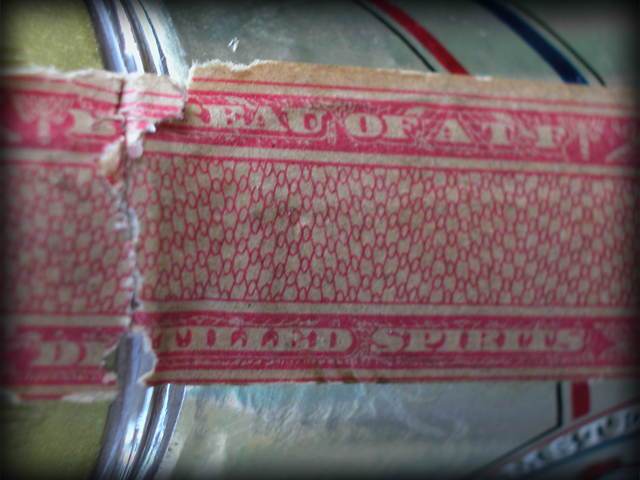 Certainly this isn’t any sort of pre-Prohibition treasure but it’s definitely got an historical feel about it. If anyone can help me refine these guesses, leave a comment or drop me a line. Oh, and yes, I opened and tasted it. Intense marzipan flavor with a distinct bitter finish. I can’t figure out if the finish is from the flavoring (peach pit kernels would definitely give you that) or from the coloring.